BSF Head Constable Recruitment 2016: The candidates who are looking for the latest police jobs can apply the BSF HC vacancies 2016. The Border Security Force has been invited the application form the eligible candidates for the post Head Constable & Assistant Sub Inspector. There are around 622 vacancy. This is one of the good opportunity for the applicants. So the aspirants can utilize the BSF Head Constable jobs 2016. The applicants can download the BSF HC application form 2016 from the official site bsf.nic.in. You can also download the Border Security Force notification 2016 application form from our Indrajobinfo.co.in site. If you want to check the latest job updates you must like our social page (Facebook, Twitter, Google+ & LinkedIn). The candidates must check the eligibility details on the BSF Head Constable notification 2016. The applicants who fulfill the eligibility criteria can apply the BSF ASI application form 2016. The eligible and interested aspirants can apply Border Security Force Head Constable application form 2016 on or before July 15th 2016. More details like age limit, academic qualification, application fee, selection process. how to application other information provide here. Here we provide the instruction for the candidates how to fill the application for BSF Head Constable vacancy 2016. 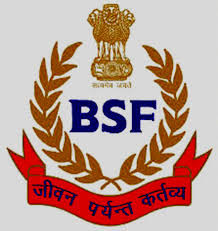 Name of the organization: Border Security Force (BSF). Post Name: HC (Head Constable) & ASI (Assistant Sub Inspector). Asst Sub Inspector/ASI: 152 posts. Category of Job: Govt/ Police Jobs. The candidates should have an age limit not less than 18 years and not more than 28 years. Age relaxation will be applicable for the aspirants as per the government norms. The applicants who have pass the 12th/Diploma/Degree from any recognized university/institute can eligible apply the BSF Head Constable vacancies 2016. The aspirants need to pay Rs. 50/- for the application fee. There is no application fee for the reserved candidates. The selected applicants in BSF Head Constable recruitment 2016 will be based on the following rounds. The shortlisted candidates will be getting the scale pay details given. HC/Radio Operator: Rs. 5200/- to Rs. 20,200/- + grade pay Rs. 2400/. ASI/Radio Mechanic: Rs. 5200/- to Rs. 20,200/- + grade pay Rs. 2800/. Open the official website bsf.nic.in. Read the BSC HC advertisement 2016. Eligible candidates can apply the application form. Fill the form with correct details. Finally post the application to the address mention in the notification. Start date of application form: 16.06.2016. Last date of application form: 15.07.2016. BSF Head Constable/Assistant Sub Inspector Recruitment Notification & Application Form 2016.